Mahabalipuram, the famous centre of Pallava art and architecture, is situated on the coast of Tamil Nadu. The local traditions and the foreign accounts vividly refer to the submergence of six temples out of seven that existed here. Mahabalipuram is an ancient city located in the Kancheepuram district of the southern Indian state of Tamil Nadu. It is well known for its architectural marvels and is recognized as a world heritage monument by the UNESCO. Historically speaking, Mahabalipuram was once part of the Pallava Dynasty, a Tamil dynasty that ruled over part of southern India between the 3rd and 9th centuries AD. The epigraphical sources also say that the Pallava kings had active overseas contacts with Sri Lanka, China and the Southeast Asian countries. A significant amount of coins and other artefacts excavated from this region also indicate a pre-existing trade relation with the Romans even before it became a part of the Pallava Empire. During Pallava period, Mahabalipuram became an important centre of art, architecture and literature. One of the architectural achievements of the Pallava kings was the construction of a complex of temples commonly known as the ‘Seven Pagodas of Mahabalipuram.’ Of these seven temples, only one – the Shore Temple, remains visible today. The other six temples are thought to have been submerged under the sea. Shore temple is a complex of three temples, one large and two small, located right on the shores of the Coromandel Coast of the Bay of Bengal in Mahabalipuram. Built under Narasimhavarman II in the 8th century, it’s the earliest significant free-standing stone temple in Tamil Nadu. Unlike most of its neighbours at the site, it is built of cut stones rather than carved out of caves. It has two shrines, one dedicated to Shiva and the other to Vishnu. This five-storeyed Hindu monument is a pyramidal structure 60 ft high and 50 ft square at the base. Mahabalipuram’s early history is completely shrouded in mystery. Stories passed from one generation to the next tell of a large, beautiful city that once occupied the area. The local tradition does not mention how old the city is but associates it with the King Bali, also known as Mahabali (grandson of prahlad). This king is recorded to have sacrificed himself to Vamana, the fifth avatar of Vishnu, following which he is said to have attained enlightenment. Mahabalipuram literally means ‘city of the Great Bali’. Myths also mention that the God Indra became jealous of of the architectural elegance of the monuments of Mahablipuram, and as a result they caused floods to occur, which submerged most parts of the city, except for a few structures that are seen now. Back in april 2002, an expedition team jointly sponsored by Great Britain’s scientific exploration society (SES) and India’s national institute of oceanography (NIO) made the discovery of a submerged complex of ruins off the coast of mahabalipuram. 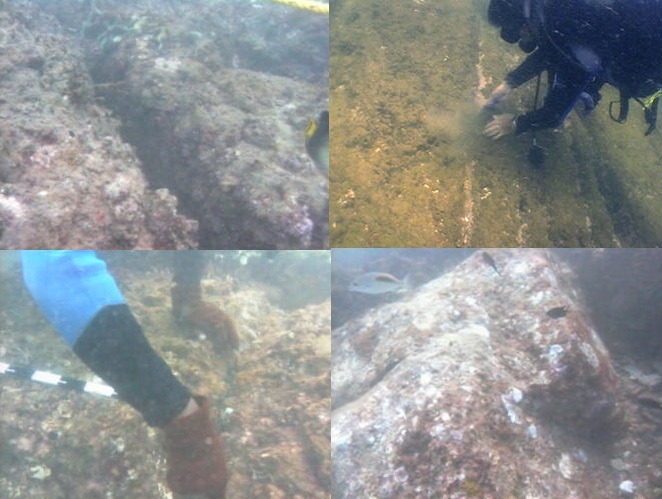 Diving in challenging conditions, the team found the foundation of walls, broken pillars, steps, and many scattered stone blocks. During the Tsunami that struck the coast in late 2004, the sea pulled back about 500m. It was reported that “a long, straight row of large rocks emerge(d) from the water just before the waters rushed back again.” When the waters returned, these features were submerged again. Still, the force of the tsunami managed to expose some objects that were covered by centuries of silt. These objects include a large stone lion found on Mahabalipuram’s beach, as well as a half-completed rock relief of an elephant. Since these incidents, several studies and excavations have been made and are being made by the Archeological Society of India (ASI) with the help of the Navy and in partnership with international agencies. 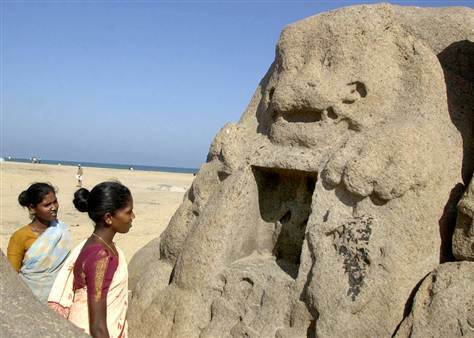 The excavations have thrown up evidence that a large network of temples once existed along the coast of Mahabalipuram. The remains of a temple approximately one-and-a-half times the size of the still standing Shore Temple structure, plus a smaller temple on the same excavation site, have been laid bare by the excavations. Additionally, several submerged structures have been found in the sea. 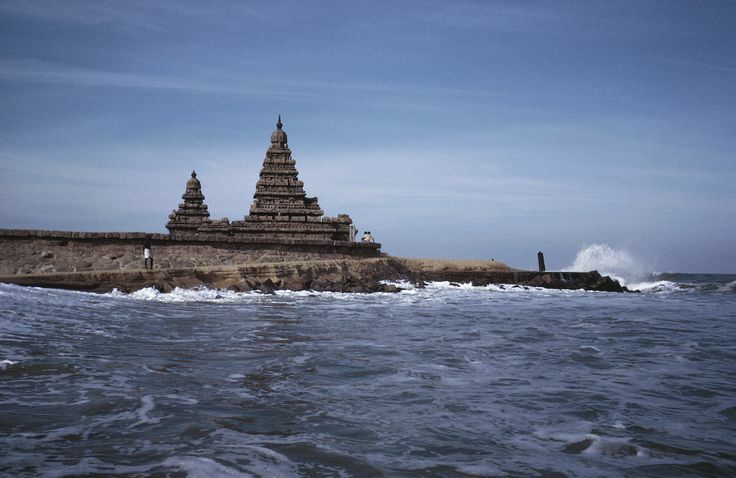 The underwater exploration off Mahabalipuram shows the presence of fallen and scattered long walls and structures. A large number of dressed stone blocks of rectangular and square type of building materials were found at several places. Most of the remains are disturbed and scattered in a large area. The presence of man-made structures of Mahabalipuram in 6–8 m water depth raises many interesting questions, such as when they were constructed and how and why they happened to be there. It is hoped that with further investigations, a greater understanding of these underwater structures can be gained and that the myth of the seven submerged temples might one day be considered as a true historical event.